Wait. Before we go over the methods it is important to know what you are trying to accomplish. These will work on your standard pin tumbler locks, which is pretty much the style of your everyday lock. This lock has two main parts: the bible and the plug. The bible has the driver pins. Most often, five pins with a uniform length that all rest on a spring. The plug has the key pins which are not a uniform height. How a pin and tumbler lock works is that the key will lift the lock’s key pins. This compresses the springs and moves the driver pins up into the bible. The key pins resting in the plug and the driver pins being in the bible means that the pins have reached the shear line. The shear line is the gap between the plug and bible that when unencumbered allows the plug to turn, opening the door. So to get back in your house, all you need to do is move those pins. There are only two tools necessary for this process, a tension wrench, and a rake (this technique will work on most home doors with security pins). 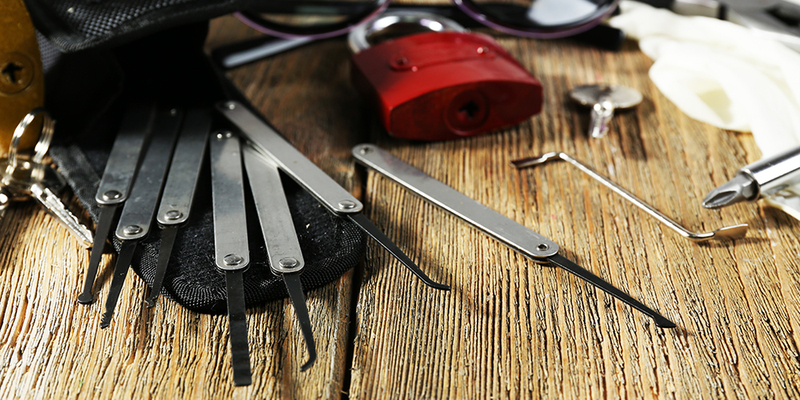 These lockpicking tools are not available in many stores, but can be purchased online. If you want to invest in a full lock pick set these tools are staples of the art, and can be found in pretty much any set. Before buying any of these tools you should take a look at your state lock pick laws, as they may prohibit ownership of lock picks without a license (for most states it boils down to, “don’t be a criminal”). If you don’t want to buy the tools you can make rudimentary versions out of paperclips. And although this will work, know that it will take significantly more time than with the professional tools. 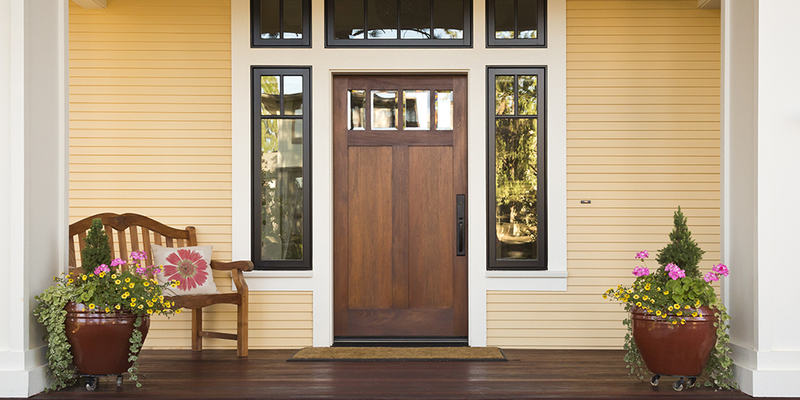 So now that you have your tools, it is time to get you into your home! 1. Begin by inserting the tension wrench into the keyhole as if it were a key. Make sure that it is placed on the opposite end of where the key’s teeth (grooves that move the key pins) would go. 2. Twist the wrench to see which way has more give. The way with the most give is the way the tension wrench will be turned when the lock is opened (the way the key would be turned). 3. You will apply tension on the tension wrench (hence the name), in the direction you determined in the last step, during the rest of the picking process. 4. Insert the rake into the keyhole (against the side that would touch the key’s teeth), then push and pull the rake in and out, raking the lock. So right now you are applying tension to the tension wrench (Not too much tension. Don’t bend the wrench) and raking with the rake. 5. Try different ways of moving the rake; wiggling, vibrating, etc. (while still applying pressure on the tension wrench in the correct direction). 6. The pins reach the shear line. 7. Twist the tension wrench like it were a key. 8. The lock is open. This method is much more an art than it is a science, so practice will always achieve quicker results. To begin you will need a key blank, a file, and the key of the lock you want to bump. 1. Measure the maximum depth on the key (the deepest groove). 2. Measure the distance between each groove. 3. File the maximum depth at each point where there needs to be a groove. 4 The end product will look like a saw blade. Refine the new teeth to be as close to a 90-degree angle as you can manage. 5. Sand the end product so the teeth are not jagged. 6. Remove the stop point on the key (this is the chunk of the key that aligns it and keeps it from going into the lock further). Without it removed you will need to take the key out one click each time before bumping it. 7. Fill the space between the front of the lock and the bow (the part, usually round, of the key that does not go into the lock and acts as a grip for your fingers) with rubber or a spring. With these added steps, the lock can be bumped much quicker. The bumping process relies on moving the pins the same way as the picking process described above, but it moves them all at the same time. With each bump, the key will attempt to move the pins to the shear line, and must be turned as the lock is bumped. a. Strike the key with a rubber hammer or comb when it is in the lock. b. Turn the key as the key is struck. This may take a few hits, and make sure you are turning the key the correct direction. 1. Place the drill bit on the side of the lock where the teeth of the key would go (this is the side that will have the pins) and drill. 2. Turn the lock with a flat head screwdriver, and if it does not open increase the size of the drill bit. 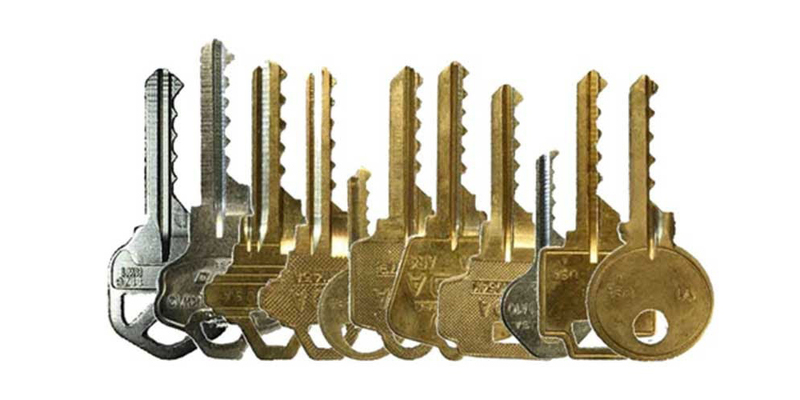 These are the methods that your locksmith is going to use 98% of the time. 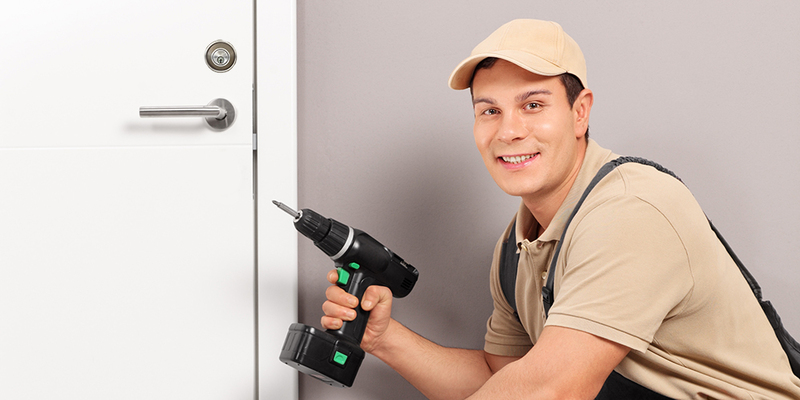 If you do end up calling a locksmith, you may also notice that they can do these things in a matter of seconds. Always remember that locksmithing is an art more than it is an exact science and that success will be dependent on practice. So pick it or bump it, but if you drill it make sure that you replace the lock. Now you know the top three ways that an expert locksmith would use to open your door, you might find that some of these methods don’t work on your particular locks. You may need to find another way to gain entry. Once you get good at raking the lock, you may find that you prefer single pin picking. As you practice, you will hone your skills, find new/better ways, and you will never be locked out of your home again.